Home Feather GMERS Medical College Dharpur Patan Nikon B700 Nikon D500 Pied Cuckoo Pied Cuckoo - a monsoon visitor..
Pied Cuckoo - a monsoon visitor..
Pied Cuckoo is a monsoon visitor to the India. 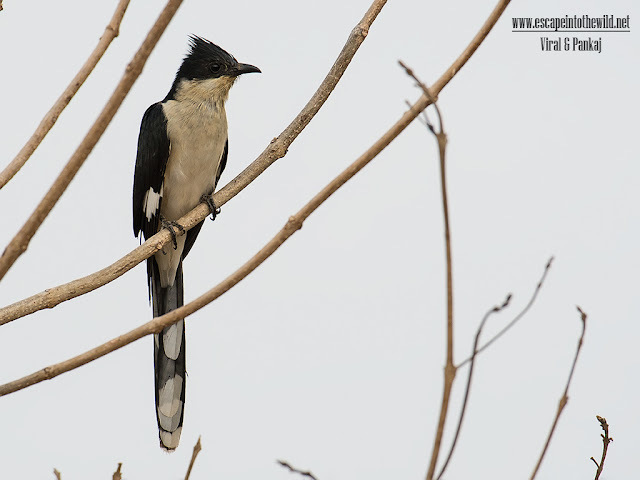 In our campus we see many time Pied Cuckoo. Today morning while waiting for school bus for kid, we heard call of it and it was very nearby. It was seated very close to our backyard. We rush to home for camera. We took the few shot of Pied Cuckoo. All and sudden Pied Cuckoo take the jump and star forging. Pied Cuckoo catch the Painted Grasshopper which seen in good number at this time of season to campus. Then Pied Cuckoo clean the Grasshopper and gulp it in last.